Your article, Strip private banks of their power to create money, highlights some of the problems of the global money and banking system, but falls short in the proposed solution. The problem is not private money creation, per se, but the monopolization of credit (money creation) in the hands of a private banking cartel and the collusive arrangement between bankers and politicians. In today’s world, banks get to lend our collective credit back to us and charge interest for it while central governments get to spend more than they earn in overt tax revenues, relying on the banking system to monetize government debts. These two parasitic drains on the economy, interest and inflationary government debt monetization, create a growth imperative that is destroying the environment, shredding the social fabric, and creating ever greater disparities of income and wealth. Turning over the money monopoly to politicians (what I call the “Greenback solution”) will not change things very much. It will be the same people wearing different hats. The political process has been so thoroughly corrupted and taken over by this small elite class that political approaches to solving the money problem have no chance of passage anyway. I articulated that argument a few years ago in my Alternet article, The End of Money: Take Power Back From the Money and Banking Monopoly. True solutions must emerge, and are emerging, from society and from associations of small and medium-sized businesses. Money is first and foremost a medium for facilitating the exchange of goods and services and other forms of real value, but the exchange function can be effectively and efficiently provided outside the banking system and without the use of conventional political money. This is being done for associated businesses through credit clearing exchanges and through the issuance of private currencies or vouchers by businesses that produce real value. Both approaches have the capacity to provide exchange media that can be used by general public as well. So, rather than ban private issuance of currencies, such private issuance needs to be proliferated and encouraged. There needs to be competition in currency so that there will be a sufficient amount of exchange media, and so that political currencies cannot be abused without losing patronage in the market. Rather than establishing the state as the money power, we need to have a separation of money and state. 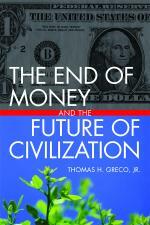 That argument is more fully developed in my latest book, The End of Money and the Future of Civilization. This entry was posted in Banking, Exchange Design, Geo-politics, Prescriptions, The Debt Imperative and tagged Financial Times, Greenback solution, Martin Wolf, money monopoly, private currencies, private money creation. Bookmark the permalink. Have you seen the Ripple project? I think is has a really great potential popularizing the community credit idea and making it easy to use for everybody. Unfortunately it never gained much popularity. Even though it is still under heavy development, the system can be used right now. You can extend credit lines to people and organizations you trust, in any existing currency or any arbitrary, new currency. Ripple will automatically find trust paths to other users you might want to transact with, even if there is no direct connection. It even does automated translation between currencies, if it can find somebody on the system who is willing to make the trade. It’s really amazing. You should check it out some time. I think that’s almost exactly what we’ve been waiting for. Yes, I’ve been aware of Ripple for many years but have not kept up with developments in it. I have heard some of my associates speak of using block chain technology with Ripple. I’m not sure at this point what that adds to the functionality or prospects for its wide adoption. The idea of being able to draw upon credit obtained from those in your close communities to pay for goods and services received from strangers is of course what we need to achieve. A global network of small localized credit clearing exchanges that adhere to the same solid procedures and protocols for credit allocation is the ideal that I envision. If Ripple can achieve the same result I’d like to be shown how. In my view Ripple definitely is a tool that can easily be used by localized credit clearing groups to manage all the member accounts and do automated clearing. The procedures and policies will of course have to be chosen by the members of the group. At it’s current state Ripple only supports using currencies that have a 3-letter acronym, but it’s already prepared for using any arbitrary unit of account that people can agree on. Every group would be working inside the same worldwide Ripple system. This could even enable easy trading between members of different groups, provided there are people or organizations that are part of multiple of those groups and would create sell and buy offers in Ripple’s built-in trading system. Maybe I’d have to know a little more about what exactly you are imagining to answer your question. It’s been some time since I’ve read your book, and I don’t actually have it with me where I am right now. I first heard of Ripple in 2006 and thought it was a great idea. Back then it basically was a one-man-show, run by a single guy from Vancouver. I feel this evolution will fase out a very many professions not the least of witch will be the “INSURANCE INDUSTRY”. My thoughts? About Time.